Welcome to the Super Bowl edition of the Weekly Roundup. Just like Tom Brady winning Super Bowls, discount brokerage deal announcements never get old. And, just like the big game itself, for DIY investors, landing a great offer when opening an online brokerage account is also a reason to celebrate. Fortunately, this edition of the roundup makes scoring a great offer even easier. We kick things off with a highlight of yet another online brokerage deal announced last week and then go deep with an analysis of the deals being offered – specifically the commission-free trade promotions. Also on the field for this roundup: tweets about online brokerages and what DIY investors were chatting about in the forums. There’s an old saying that if you chop your own firewood, it keeps you warm twice. For DIY investors hoping to lower their own costs for investing, hunting around for a promotion or deal will result in even greater savings – especially this month. Just in time for the final push towards the RSP contribution deadline at the end of February, one more Canadian online brokerage launched a promotional offer, marking the third consecutive week in which a new online trading account deal has launched. 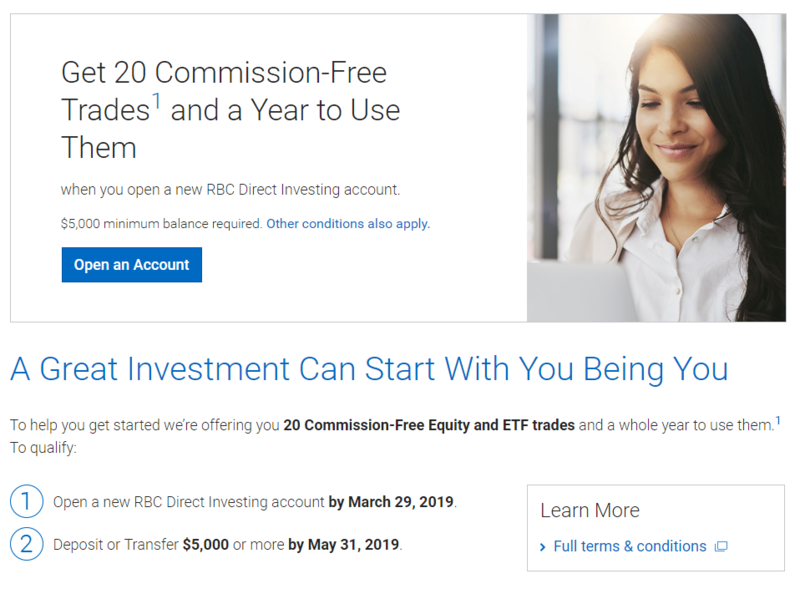 This past week, RBC Direct Investing launched a commission-free trade promotion that offers 20 commission-free trades for a minimum deposit of $5,000. These commission-free trades are good for up to one year and the offer runs until March 29th. While RBC Direct Investing launched a similar offer late last year (that offer is still technically live) targeted towards healthcare professionals, this latest offer is being widely promoted to the general public and comes with a new (and interesting) deadline. Now that RBC Direct Investing has more publicly joined the fray, all of Canada’s major online brokerages have an offer of some type to try and entice DIY investors into opening an account. With over 30 distinct offers for DIY investors to sift through, there’s a new challenge to deal with (ie figuring out which deal is best) however fortunately, the two most popular categories of offer fall into either cash back promotions or commission-free trade offers respectively. We have covered the cash back promotions in previous roundups so in this roundup we’re going to drill down on commission-free trade offers to see what these offers reveal about the brokerages offering them as well as what it means for DIY investors. Currently, there are six Canadian online brokerages offering a commission-free trade or commission credit offer. As shown in the table below that compares these offers, there are a couple of moving parts when it comes to comparing these offers, including how long an investor has to take advantage of these free trades, what the minimum deposit required would be to qualify and when these offers are set to expire. Long time readers of the roundup and the discount brokerage deals section will note that the commission-free trade promotions currently being offered now come with a longer duration of time that investors have to take advantage of them has increased. Historically, the duration made available to investors to use the commission-free trades typically ranged between 30 and 90 days. Now, the shortest duration to use these trades is 60 days (Questrade) and the longest at one year, is available at RBC Direct Investing and National Bank Direct Brokerage. It is worth mentioning that this is not the first time RBC Direct Investing has used this promotion. Last year, for example, RBC Direct Investing also offered the 20 commission-free trade promotion with one year to take advantage of commission free trades. With National Bank Direct Brokerage also throwing their hat in the ring with year-long free trades, we couldn’t help but wonder whether the appearance of Wealthsimple Trade’s commission-free trading model has forced Canadian online brokerages to make the “free trade” period longer or if it’s simply competition between larger players driving these dates being extended. Either way, this is a positive development for DIY investors. Another interesting observation is the expiry dates on the offers themselves. While RSP season was clearly a catalyst to prompting online brokerages to create promotions, the expiry dates of the promotions reflect the various strategies of the online brokerages to stay visible and accessible at a point in the year when money is on peoples’ minds. In addition to RSP contribution deadlines, there is also tax season, specifically the deadline to file taxes (end of April) that only a handful of brokerages are currently poised to have offers live for. What individuals who receive a refund ultimately decide to do with money is something that online brokerages like Desjardins Online Brokerage, Questrade and National Bank Direct Brokerage would be in a position to benefit from. The expiry dates for these offers enable them to be visible to anyone shopping around for an online trading account along with the potential cash to fund it with. The tax season strategy is not new, however this year there is something worth paying attention to. Notably, this year Wealthsimple and TurboTax announced a partnership/integration that would enable individuals who file their taxes through the TurboTax software with easy access to sign up with Wealthsimple. Although discount brokerages have offered discounts to users of the tax filing software in the past, this integration offers Wealthsimple privileged access to a pool of individuals who are already investing (or thinking about it). Canadian online brokerages with offers that expire close to the RSP contribution deadline may want to consider either extending offers or putting in place other offers geared towards Canadians thinking about what to do with their income tax refunds. Finally, it’s worth taking a look at the numbers driving the appeal of the offers themselves. In terms of comparing offers to one another, we analyzed commission-free trade offers at each online brokerage that factored in what the maximum number of trades would be for every dollar deposited as well as for the duration of time available to use these offers. On a strict ROI basis, Questrade’s $88 in commission credits offers up a return of 1.7% (trades per dollar deposited) followed by National Bank Direct Brokerage (1%) and RBC Direct Investing (0.4%). Of course, there are other factors to be considered when choosing a commission-free trade offer, most importantly how long an investor would have to take advantage of this offer. When compared that way, the offer from National Bank Direct Brokerage stands out as providing the best combination of value and availability. With 50 commission-free trades for a deposit of $5,000, this works out to a 1% return on every dollar deposited. What really adds value here for investors, however, is the duration. With one year to use these free trades, investors can pace themselves with purchases, sales and any other opportunistic strategies. Interestingly, RBC Direct Investing’s latest offer puts them in second place in the group, albeit with a significantly lower number of trades, because the time to use the trades is one year. Rounding out third place was Questrade who had a much lower hurdle to qualify for up to 17 trades (assuming purchases that work out to $4.95 per trade). Like all comparisons, it is important to acknowledge that different investors will have different priorities. In this case of the above analysis, it assumes that how many free trades you get is as important as how long you have to use them, which may not be the case for all investors. Some investors might value the flexibility of being able to make a trade later on in the year whereas others are looking for get started with a smaller balance and basic portfolio building. By comparing the latest crop of Canadian discount brokerage deals, it is evident that less popular online brokerages who want to compete against bigger and better-known online brokerages have to be willing to spend more in order to get the attention of DIY investors. It is also important for DIY investors to consider what they’re ‘buying’ when they choose an online brokerage. Promotional offers are good consider after due diligence is done on a brokerage rather than as a starting point. Deals shouldn’t be a substitute for determining what features and pricing best suit their needs. With ETFs continuing to grow in popularity with DIY investors as well as commission-free ETF trading options now available, investors interested in passive investing strategies have more choice than they’ve ever had. In this post from the Canadian Investor thread in reddit, one DIY investor is looking to the forum for building a portfolio through a popular online brokerage. Mutual funds cheaper than ETFs? If you think Stranger Things is just a Netflix show, here is something to challenge that. In a recent article in the Globe and Mail, there was a look at some situations with passive investing strategies in which low cost mutual funds end up being less expensive than their popular ETF counterparts. This post in the Financial Wisdom Forum sparked some interesting responses. That’s a wrap on another action-packed week. Despite a rather sleepy Super Bowl all around, it was fun to witness both the longest punt in Super Bowl history and see Tom Brady collect yet another championship ring. Fortunately, the week ahead will be much more exciting. All the best to everyone celebrating the Lunar New Year and as a gentle reminder, Valentine’s Day is coming up and nothing says ‘I love you’ quite like getting a deal on an online trading account. Just saying. Have a profitable week!